When employees enter their office buildings, their minds are centered on their daily tasks –or the weekend ahead. The last thing on their mind is a fire occurring in the office. Fires in the office are a very real possibility that happens more often than anyone realizes. In order to avoid a tragedy in the workplace, it is up to both employer and employee to eliminate the causes. 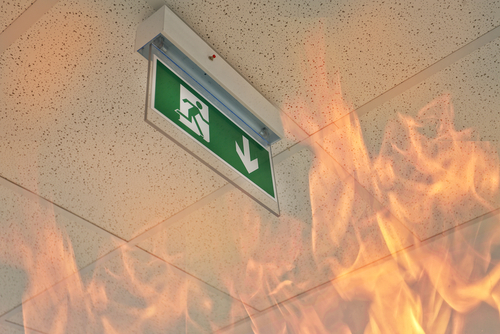 Here are the common causes of an office fire and tips to prevent them. Cooking equipment is the leading cause of fires in residential spaces and the same goes for an office. While an office does not have the same cooking appliances a home kitchen possesses, office kitchens do hold similar equipment. Coffee makers, microwaves, and refrigerators have the ability to start fires if they are not used correctly or used when damaged. To avoid a fire, make it a part of the office manager’s tasks to check the kitchen before they leave for the day. They will want to make sure that all of the appliances have been turned off. Monthly inspections should also occur to ensure that the appliances are not damaged and working properly. Encourage employees to report damage they may seem in the interim. If appliances are damaged in any way, be sure to unplug them and place an “Out of Order” sign on it. An office also relies on their computer and lighting equipment to complete their daily tasks. The main cause for concern with computers and another electronic equipment is overheating. While they are built to shut down when they get too hot, they can fail to cause a fire in your building. The building’s electrical system is the next cause for office fires. Light and heating equipment will spark a fire if they are damaged or place a strain on the electrical system. By default, the excess strain placed on the electrical system will cause the breakers to trip. If the electrical system is older or in need of an update then it may not override the trip. That leads to an overworked system that will throw sparks or overheat and will cause a fire. System maintenance needs to become a priority in your office. Call in a professional to routinely check your system for any possible problems and updates. Combustible materials on the premises is a potential cause for a fire. Paper, packaging, and furniture are all essentially kindling if not stored or used correctly. Other combustible material includes any chemical or flammable liquids. If placed next to one another, it is a recipe for a fire. Be sure that all loose papers are gathered up and put away, purchase filing cabinets to hold them all. All old packaging and other trash should be thrown away and not left sitting around. Trash should be taken out regularly. Cleaning products must be stored away in a cool, dry place away from flammable materials. To prevent fires from consuming your entire building then invest in fire protection equipment for your building. Fire alarms and sprinklers can minimize damage to the building but most importantly, will save lives. Do not forget to install fire extinguishers in various rooms of your building as well. To make all of your fire equipment purchases, look to Mike Green Fire Protection. We provide all of the fire extinguishers and install the systems your building needs to stop a fire in its tracks.